In what way would you like to support Boston Children's Hospital? Working with you and your professional advisors, we can tailor gift plans to fit your specific needs, assets and goals. Please contact us if you have any questions about your giving options. A charitable bequest in your will or revocable trust allows you to invest in future generations of care at Boston Children's without affecting your cash flow during your lifetime. You maintain control of your assets. If your situation changes, you can revise your will at any time. You can claim unlimited estate tax deductions for your bequests. If you've already written your will, you can easily amend it with a simple document called a codicil prepared by your attorney. Donating the remaining balance of your retirement plan makes for a tax-wise gift. To avoid including such a plan in your taxable estate, we recommend using your successor beneficiary form to name Boston Children's your beneficiary rather than including the plan in your will. You intend to bequeath real estate, a business interest or other specialized property to Boston Children's. A charitable gift annuity allows you to make a meaningful contribution to Boston Children's and receive guaranteed fixed payments for life in return. Payments begin immediately or at an agreed-upon future date. When you make a gift of cash or other appropriate property as an immediate charitable gift annuity, you and/or up to two others you name receive generous fixed payments for life. When the annuity is funded, we work with you to determine the frequency and amount of each payment. You may immediately deduct a portion of your gift off your taxes. Your annuity payments are part tax-free income, part ordinary income and part (15%) capital gains income. You have the satisfaction of making a gift that benefits you now and Boston Children's later. 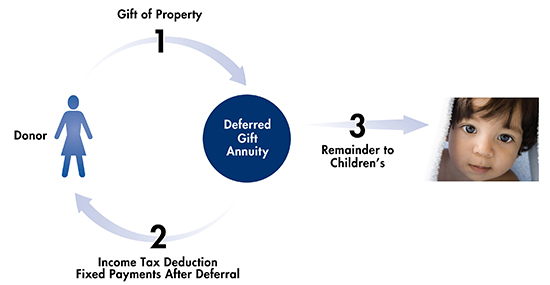 The deferred charitable gift annuity lets you defer the start of income payments to a future date. It's worth considering if you're in your high-earning years and looking to save on income tax now while building an additional source of revenue for retirement. Since you decide when your annuity payments to begin, you can plan for them to coincide with important life events, such as retirement or helping a grandchild with tuition. The longer you defer payments, the higher the effective rate you'll receive — and the larger your charitable deduction. Also, a portion of each annuity payment is tax-free as the return of principal. You have the satisfaction of planning for a gift that benefits you now and Boston Children's later. Your charitable gift annuity is a contract between you and Boston Children's. Your annuity payments are an obligation backed by a reserve and the full assets of our institution. Your charitable income tax deduction is based on the market value of the assets you contribute minus the present value of the life-income interest you retain. If you fund your deferred annuity with appreciated securities, you won't pay an upfront capital gains tax. Only a portion of your gain is recognized, with the tax spread over your annuity payments. A charitable lead trust holds your appreciating assets and pays income to Boston Children's for a period of years. When this period concludes, the remaining principal is returned to you, your children or other heirs. Consider this giving option if you hold appreciating assets, are in a high income tax bracket and need tax relief, and want Boston Children's the hospital to be able to use your gift right away. Your gift/estate tax will be reduced by the present value of the income payments to Boston Children's. Your heirs won't be taxed on any appreciation that occurs in the trust. You can determine the amount and term of payments to Boston Children's so that your heirs pay fewer or even no transfer taxes when the principal reverts to them. 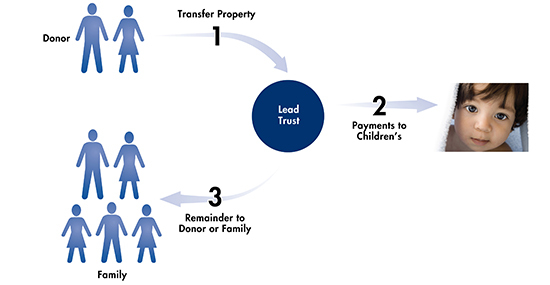 A lead trust can pay Boston Children's a fixed amount of income every year (a charitable lead annuity trust) or a fixed percentage of the value of the trust principal, which is revalued annually (a charitable lead unitrust). 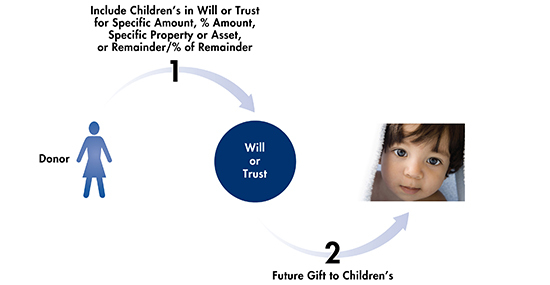 A grantor lead trust holds your gift of appreciating assets, pays income to Boston Children's for a period and then returns the balance of the principal to you. 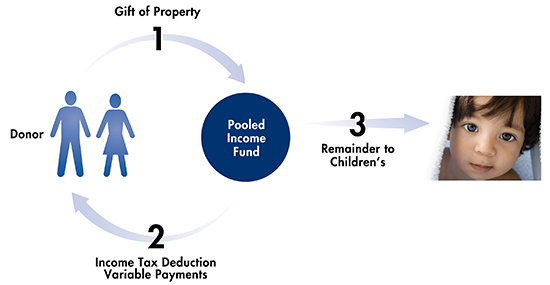 You receive an upfront charitable tax deduction equal to the income payments received by Boston Children's. The annual earnings distributed to you will be taxable to you. A non-grantor lead trust can be funded with shares in a growing family business and reduce the cost of passing ownership to the next generation. The income earned by a non-grantor lead trust while in operation is not taxable to you. The balance of the principal is paid to children or other heirs. When you establish a charitable remainder annuity trust with a gift to Boston Children's, your beneficiaries receive a fixed percentage of the initial value of your gift for their lifetime and/or a 20-year term — and the income is tax-exempt. Consider this giving option if you want to make a significant gift of assets to Boston Children's while keeping or increasing the income you receive from these assets. You receive an immediate income tax deduction for a portion of your contribution, based on the full, fair market value of the assets you contribute. You or your designated income beneficiaries receive stable, predictable income for life or a term of up to 20 years. You have the satisfaction of making a significant gift that benefits you now and Boston Children's later. Annuity trusts pay beneficiaries a fixed percentage of the initial value of the assets that funded the annuity. 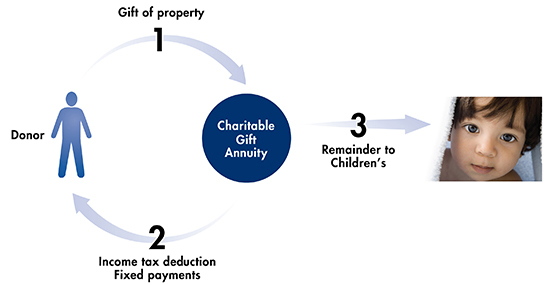 Annuity trusts are well-suited for gifts of long-term tax free bonds. An annuity trust is a separate legal entity administered by a trustee. Either you, your financial advisors or Boston Children's can serve as trustee. We administer a significant portfolio of charitable trusts where the trust pays for any fees. At your request, Boston Children's will serve as trustee for annuity trusts established with a minimum gift of $50,000. To help you decide which option is best for you, we can share sample trust illustrations and discuss details with you and your advisors. 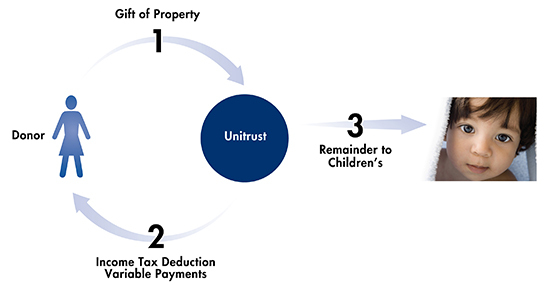 A charitable remainder unitrust is an individually managed trust. It's designed to let you make a significant gift to Boston Children's, paying you and your beneficiaries an income based on a fixed percentage of the gradually increasing principal. Consider this giving option if you hold appreciated assets, want your income to grow over time and/or desire maximum flexibility in the operation of your gift. You pay no upfront capital gains tax and receive an immediate income tax deduction for a portion of your contribution. You or your designated beneficiaries receive income for life or a term of up to 20 years. •	You have the satisfaction of making a significant gift that benefits you now and Boston Children's later. The income you receive is a fixed percentage of the trust value and should increase over time. No capital gains tax is applied to the growth of principal in the unitrust. Unitrusts can be set up specifically to fund a loved one's education, meet their special needs if they have a qualified disability or support aging parents. A unitrust is a separate legal entity administered by a trustee. Either you, your financial advisors or Boston Children's can serve as trustee. We administer a significant portfolio of charitable trusts where the trust pays for any fees. At your request, Boston Children's will serve as trustee for annuity trusts established with a minimum gift of $50,000. To help you decide which option is best for you, we can share sample trust illustrations and discuss details with you and your advisors. A growth and income fund (or pooled income fund) is like a charitable mutual fund. Your irrevocable gift of cash or securities is combined and invested with gifts from other donors. In addition to making a significant gift to Boston Children's, Each quarter, you or your beneficiaries receive a proportional share of its net income each quarter. A portion of your gift is immediately eligible for a gift credit and an income tax deduction. Your donation of appreciated assets won't incur any capital gains tax. When you donate your securities to a Boston Children's growth and income fund, the income you receive from your gift can exceed dividends you might otherwise earn on these same securities. You enjoy the benefits of mutual-fund investing: a diversified portfolio, professional management and simplified reporting. You can join our growth and income fund with a gift of $25,000 or more. Your quarterly payments will vary with the fund's performance. The fund is invested for income and modest capital appreciation. At your request, we can provide the annual report with past performance and current objectives. Your payments are taxed to you as ordinary income. 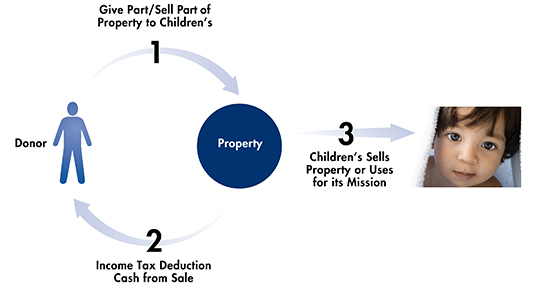 A charitable bargain sale occurs when you sell your residence or other property to Boston Children's at a price below the fair market value. The difference between the market value and what we pay to you is the charitable gift amount you may deduct from your taxes. 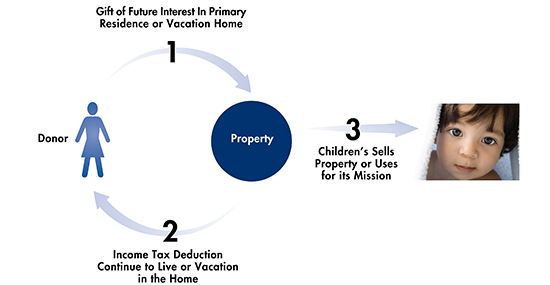 You qualify for an immediate income tax deduction equal to the appraised value of the part of the property you donate. You don't owe any capital gains tax on the donated portion of the property. You receive cash from the sale portion. You have the satisfaction of making a significant gift to Boston Children's. You must have an independent appraisal of the property to determine fair market value. You and Boston Children's agree on a purchase price that is below the fair market value as determined by your independent appraiser. Your gift is the difference between the fair market value and the purchase price. As with all gifts of real estate, we must review and approve the transfer. If there is a mortgage or lien on your home, it could result in taxable income to you and complicate the transfer. Retained life estate allows you to donate your personal residence, such as home, cabin or farm, to Boston Children's while retaining the right to live on and use the property for the rest of your life and/or a term of years. You have the satisfaction of making a significant gift that benefits Boston Children's later.